Begin your Tuesday with Wendy from Golden Bay. Joining Wendy on the show today is Golden Bay local Sacha Horton to speak about the Live Poets which happens across the top of the south. The Fitz Family (Chris, Kimberley, Matthew and Jack) speak with Wendy ahead of their first live show on Fresh FM this week from our Nelson studio. Get your local news, weather and what's happening across the top of the region. All this packed into two hours only on Fresh FM. Golden Bay is hosting for the second time the New Zealand Living Wood Fair. Dale Westerink owner of the land 'Totara Whenua' where the fair is being held, speaks to us about the history of the property. Director Steve Wilkinson lets us know about the upcoming play at the Takaka Playhouse, Miss Abigails Guide to Dating, Mating and Marriage. 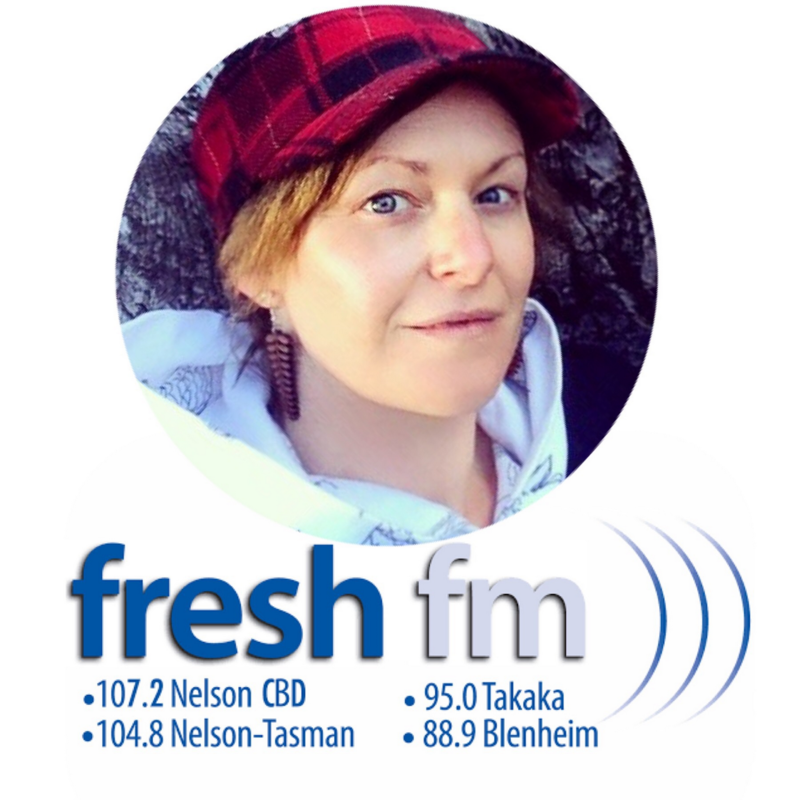 Wendy has your local news, weather, whats on across the top of the South Island and music to begin your morning. With guest Dale Westerink - Living Wood Fair. Steve Wilkinson - Takaka Drama Society. Featuring Living Wood Fair. Takaka play - Miss Abigails guide to Dating, Mating & Marriage. Playing For Change. World Dance Day. Gumboot Friday. Rock The Bay Free Youth Concert. Be informed on what's happening around the region as Wendy brings you local news, weather, fundraisers and events across the top of the South Island. On today's show Susie Bassett speaks to Wendy about the ongoing fundraiser for the Mohua Social Services with the new cookbook Abundance compiled by members of the Golden Bay community. Directors of the Living Wood Fair for 2019 Liv and Graeme Scott are in the studio to tell us all about the fair and what is coming up for 2019 - it all sounds exciting and a weekend not to miss. Begin your Tuesday morning with our loving, bubbly and lively host Wendy live from our studio in Golden Bay. Wendy keeps you informed on what's happening across the top of the south and around NZ. Every show is full of awesome guests from all walks of life and backgrounds, amazing give away's and a mix of music not heard on any other station. On today's show original founder of Salmonella Dub Andrew Penman speaks with Wendy. Sarah Worlock from Takaka Library is on the show to speak about the get together this Friday. Be informed with Fresh Start Tuesday live from Golden Bay. On the show today NZ musician and member of the Jordan Luck Band speaks with us. PhD in Medicinal Chemistry and chronic inflammation specialist Dr Corin Storkey speaks with Wendy about Chronic Fatigue Syndrome. Iconic New Zealand folk musician Rob Joass lets us know about his latest album release Pencarrow. All this, your local news, weather for across the top of the South Island and a fab mix of music from across all of the decades. On the show today New Zealand musician Nadia Reid speaks with Wendy ahead of her four show tour at the top of the South Island. Joyce Wyllie from the Takaka Dog Trials speaks about the two day event in Golden Bay this weekend. Listen to music from Collective Soul, The Knack, Thin Lizzy, Bob Marley, The Beatles, Rag N Bone, Brother Culture, Six 60 and much more. What a show Tuesday was. New Zealand music royalty Barnaby Weir from The Black Seeds and Fly My Pretties joins Wendy on the show ahead of their gig in Nelson on Saturday night. Golden Bay local Lee Heller (PhD, law degree and teacher of critical thinking for over 13 years) is on the show to speak about confirmation bias. Australian independent band Kallidad on currently on a New Zealand tour and coming to Golden Bay on Thursday to play at the Mussel Inn. Start your Tuesday with our breakfast host Wendy live from Golden Bay. Wendy has your local news, weather, awesome guests, what's happening across the top of the South Island and she may even try to crack a joke. On today's show Richmond Mayor Richard Kempthorne speaks about the week that's been and where the region is at with the Nelson Fires. Selena Serra tells about the free youth counselling services she will be offering in Golden Bay. Elisabeth Siegmund speaks about the free self development workshops she will be running in Richmond, Nelson. Start your Tuesday off with a roots reggae vibe as Wendy comes live from Golden Bay features Tahuna Roots Music Festival and is joined by event organiser Joolz and headline act Israel Starr on the show. Mad Cafe Collingwood owner Nganga is on the show to speak about the upcoming Mad Weekend Healing Arts Festival to be held on February 16 and 17th in Collingwood. Wendy has your local news, weather and what's happening across the top of the South Island. This show features music from the New Zealand roots/reggae scene, with a few old school classics thrown in and some New Zealand faves. Takaka Fire and Emergency New Zealand Chief Philip Woolf joins Wendy on the show to speak about the efforts of the local fire brigades with the Nelson Fires. He also lets us know of the current fire safety information. Event organiser of Earthrites Liam Kumar is in the studio to tell us of the upcoming Earthrites Arts and Music Festival. Wendy has your local news, weather, the latest from the GB Weekly and a fab mix of music to begin your week.